George Graham Reviews Karan Casey's "Distant Shore"
The popularity of Celtic music has paved the way for a younger generation of performers who have gone beyond the strictly-traditional, and who have moved into new and interesting stylistic hybrids. One of the brightest lights on this scene has been the Irish-American band Solas, who since the mid 1990s, has been combining a remarkable level musicianship with a decidedly eclectic approach, doing everything from Woody Guthrie songs to very traditional Irish music to original compositions over a series of acclaimed albums. For the first four years of the group's existence, their lead vocalist was Karan Casey, who has just released her third solo recording called Distant Shore. Ms. Casey grew up in County Waterford in Ireland and says she was surrounded by music in her family. At an early age, she studied classical vocal technique, and started performing with the Foran Family, who were well-known folk musicians in Ireland. Later, she discovered jazz, and found herself enchanted with the music of Ella Fitzgerald, Nina Simone and Billie Holiday. She came to sing jazz and pop in various pub bands in Ireland, and then became a member of Atlantic Bridge. It was while she was with that group performing in New York that she was recruited by Seamus Egan along with Winifred Horan, John Doyle and others for Solas. Egan was already a championship musician while still in his teens, on multiple instruments. Solas brought together some of the finest young Irish and Celtic musicians, and Ms. Casey was a prominent part with her superb, downright beautiful vocals. Departing amicably from Solas to start a family, Ms. Casey began a series of solo albums and a somewhat reduced touring schedule. She continued in the Solas tradition of outstanding musicianship and varied material. On her last album, she even did a Billie Holiday song. Her new release, Distant Shore continues her musical journey, with an interesting collection of songs from much people as English protest singer Billy Bragg, American bluegrass and country artist Tim O'Brien, the late Scottish folksinger Ewan MacColl and even one original piece, from an artist who does not do much writing. She also has a number of guests, including O'Brien, vocalist Karen Matheson and multi-instrumentalist Donald Shaw of the Scottish band Capercaillie, American folk banjo player Dirk Powell, plus some of the musicians who appeared on her last CD The Winds Begin to Sing, including Shaw and bassist Ewan Vernal. As is usual for a recording that sounds like old traditional British Isles music, the lyrics can run from tender, poetic love ballads, to a song about murder and violence. Actually, there is less of the death and destruction among Distant Shore's musical narratives than on her last CD, which was full of it. But, as was the case last time, it's a fascinating juxtaposition to hear Ms. Casey's wonderful voice song a song about a man facing the gallows for a murder he did not commit. The instrumentation is not always purely in the Irish style, with some electric instruments, synthesizer, electric guitar. 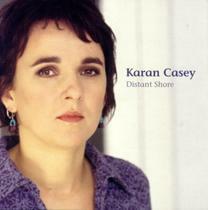 Karen Casey's new CD Distant Shore is another outstanding recording by perhaps the finest voice to come out of the new Celtic scene. In addition to her thoroughly enchanting vocals, Ms. Casey comes up with an intriguing collection of material from a rather wide variety of mostly non-traditional sources, from Billy Bragg to Ms. Casey herself. In the tradition of her previous band Solas, the musicianship is superb and the treatments of the songs very tasteful. The arrangements provide a Celtic aura, but often lead to other stylistic venues, but without distracting from the songs or Ms. Casey's voice. As on her last CD in 2001, Capercaillie's Donald Shaw served as producer, and did an excellent job balancing the eclecticism with the traditional elements. Our grade for sound quality is definitely an "A," with the acoustic instruments well-treated, and the subtleties of the arrangements nicely preserved. The CD also has a better than average dynamic range, helping to give the recording more immediacy. A decade or so ago, the Celtic scene was dominated by performances of traditional music. Karen Casey is an excellent example of an talented artist building on the traditions and taking the music in new directions. But whether or not you're much of a Celtic music fan, her CD Distant Shore, is an instantly appealing and memorable recording.